There are many people who try to lose weight by juicing. Although it seems like a very good idea, not all of them manage to get slimmer by following this method. The reason is very simple: not all juices are alike. Fruit juices, for instance, have very high sugar content, because fruits are sweet. These sugars provide the body a lot of additional energy, which should be either used or stored as fat deposits. The conclusion is that if you drink a lot of fruit juice and you don’t have an intense physical activity, you may actually gain weight instead of losing it. However, the situation changes a little when it comes to juicing mainly vegetables and leafy greens. If you drink a few glasses of green juice per day and you take care about your physical activity level and about your eating habits, you can lose weight in a steady and healthy way. This is actually the best method of controlling your weight: shifting to a healthier lifestyle and nutrition habits and never reverting to your old way of eating and drinking. If you only diet one or two weeks only to start again your heavy alcohol drinking and fast-food eating, you aren’t going to maintain your loss, as fat is going to return on your hips, waist and belly, slowly but surely. 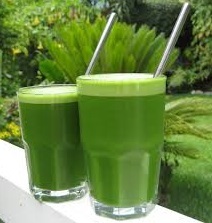 The reason why green juice is good for you is its high content of healthy nutrients. Leafy greens such as spinach and kale are a well-known source of Vitamin C, Vitamin A, Vitamin K and Vitamin E. Broccoli and bok choi are an excellent source of Vitamins B. Spinach and other similar veggies are excellent sources of iron, calcium and phytonutrients. People who want to maintain their good health should consider eating these foods at least once per day. Additionally, these vegetables are very rich in dietary fiber, so they contribute to a better digestion. It is true that juicing removes most of the fiber, but the benefits are still there, so you can safely drink a glass of freshly made green juice a few times a day. If you need the fiber content, you can always make smoothies instead of juice and enjoy all the benefits of a good intestinal transit. You can always pair a good steak with a green salad and enjoy all the benefits of baby spinach, collards, kale or broccoli. However, if you don’t like their taste too much, you won’t find pleasure in your meals. This is not a good thing, so consider having your steak with whatever side dish you like and save the greens for your juices. Juicing allows you to find the perfect mix of vegetables that would mask unpleasant tastes. By simply adding a little fresh ginger, you can change the taste of any juice, making it more pleasant. If you don’t like ginger, you can try cinnamon or any other spice with a strong flavor. The only requirement is that you like the taste. It is going to make all your green juices more palatable, so don’t give up your juicing plans only because you hate the taste of broccoli, kale or spinach. In the right combination, they can all taste much better. It’s only a matter of trying until you find the perfect blend that suits your personal preferences. Juicing is healthy and recommended for everyone. However, there are situations in which you should discuss such intentions with your doctor. If you suffer from chronic medical conditions that require a balanced lifestyle, you may want to ask your physician whether it is safe for you to go on a juice diet for one or two weeks. If you intend to drink only juice for a period of time, your doctor has to know about it. On the contrary, if you only want to replace one of the main meals of the day with green juice, but you are still going to eat your regular foods, you can do it without the doctor’s consent. However, you need to observe your body carefully and stop the juicing if you notice anything abnormal, especially if your idea is to use green juice for losing weight. Organifi Green Juice Review – Is This Powder Juice For You?